Omaha poker is one of the most popular poker variants. For many poker players who start out learning how to play Texas hold'em, Omaha is often the next game they learn to play, in part because Omaha poker is somewhat similar to hold'em in the way the game is played. There are different types of Omaha poker games, the two most popular being pot-limit Omaha (which we are focusing on here) and Omaha hi-lo. You can read about Omaha hi-lo poker rules here. If you know the rules for Texas hold'em, you are more than halfway to knowing how to play Omaha poker. However, let's first sort out how the two games are different. What is the difference between Omaha and Texas hold'em? Like hold'em, Omaha is a "flop" game that uses community cards. Just like in hold'em, players are dealt their own hands face down — their "hole cards" — and use those cards in combination with the five community cards (the flop, turn, and river) to make five-card poker hands. However, there is one big difference between Omaha and hold'em. Whereas in hold'em players are each dealt two hole cards, in Omaha they are dealt four hole cards. From those four cards, players must choose two of their hole cards to go along with three of the five community cards in order to make their five-card poker hands. Note how that also marks an important difference between Omaha game rules and hold'em. In Omaha, players must use exactly two of their hole cards and three of the community cards to build a poker hand. 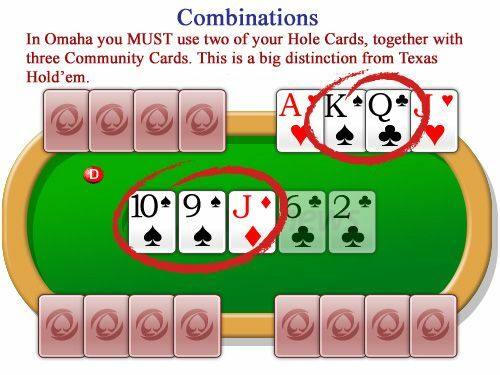 That's different from hold'em where players can use both of their hole cards (and three community cards), just one hole card (and four community cards), or no hole cards (and all five community cards, which is called "playing the board"). In pot-limit Omaha, the hand rankings are just the same as in Texas hold'em. Like hold'em, pot-limit Omaha or "PLO" is played as a "high-hand" game, which means the hands go (from best to worst): royal flush, straight flush, four of a kind, full house, flush, straight, three of a kind, two pair, one pair, high-card. Beginning players who have only been introduced to Omaha poker rules often make mistakes when it comes to building five-card hands, forgetting the rule about it being mandatory to use two of the four hole cards along with three community cards to make a hand. For example, a new player holding might look at a board of and think he has made the nuts with an ace-high straight. The problem is, you cannot make a hand using only one hole card (in this case the ) and four community cards (the four hearts on the board). In fact, this player only has a pair of queens, not a flush at all. Meanwhile any player with two hearts would have a flush, which means the player should certainly fold this weak hand to any bets on the river. Betting in Omaha poker works exactly like it does in Texas hold'em, with a small and big blind as well as a rotating button, and four betting rounds following each round of dealing — preflop, flop, turn, river. See "How to Play Texas Hold'em Poker" for an overview of how the game is dealt and the order of play during the betting rounds. Pot-limit Omaha (or "Omaha high") is known as an "action game" which is one reason why it is popular among high-stakes players. Since players start with four hole cards in Omaha instead of two, they can make a much wider range of hands. For that reason, hand values tend to be higher in Omaha than in hold'em, with players making "the nuts" or the highest possible hand much more frequently. If you think about it, in PLO players aren't dealt just a single two-card combination (as in hold'em), but six different two-card combinations (among the four hole cards) from which to choose the best hand. It isn't surprising, then, that players tend to make much better hands at showdown in Omaha poker. In Texas hold'em making two pair or three of a kind can be a very strong hand, but in Omaha there will often be better hands out there to beat those holdings. For example, say you have been dealt and by the river the board is . Using the ten and eight in your hand along with three community cards, you have a jack-high straight. The problem is any opponent holding would complete a higher, king-high straight and defeat you — and if the betting gets heavy on the river, that's probably exactly what is happening. Another example would be holding on a board of . Yes, you have a set of nines, which would be a nice holding in Texas hold'em, but in Omaha poker there are several hands that could defeat you here. Anyone with or would have a higher set, and an opponent with would have made a straight. There is also a flush possibility, meaning anyone with (two diamonds) would make a flush. Due to the nature of so many better hands, an opponent may just be calling your bets with a set of kings or queens as they may fear a straight or flush, so even if you are not facing any immediate aggression, you could still be beaten so proceed with caution. Another factor to consider when it comes to Omaha rules when playing the most popular pot-limit Omaha version of the game is the pot-limit betting format, which is another way PLO can play differently than no-limit hold'em. Like in hold'em, the minimum bet allowed in Omaha is always the equivalent of the big blind. For example, if the game is $1/$2 PLO, the minimum a player can bet would be $2. However, while in no-limit hold'em a player can always bet all of his or her chips at any point, in Omaha the maximum bet allowed is the size of the pot. Calculating what exactly is a "pot-sized" bet can be trickier than it might seem at first glance. If the pot is $10 and a player is first to act, $10 is the maximum bet that player can make — simple enough. However, if there has already been a bet and a player wishes to "raise pot," that gets a little tricky. Say there is $10 in the pot and a player bets $5, then the next player wants to "raise pot." The most that player can bet would be $25, a total calculated by adding the $5 to call plus the $20 that would be in the pot after the call ($5 + $20 = $25). In fact, preflop the blinds are considered forced bets, so once again a bit of math has to be done in order to figure out how much a player can raise even when acting first. In a $1/$2 PLO game, the maximum a player can open-raise is $7, the total coming from adding $2 or the equivalent of the big blind to $5 or the size of the pot after calling the big blind ($2 + $5 = $7). When playing in a casino, the dealer will take care of the math for you should you announce you wish to bet the pot. Meanwhile, when playing online poker the calculations are automatically made right on the screen. Just like in hold'em, position is an important element in Omaha. Many consider it to be even more important, both because of the pot-limit betting format and because of all the possible combinations a player can make with an Omaha hand. When sitting in position, you can follow the actions of your opponents and make your decisions based on the information you received. When out of position, it is much harder to make the correct decisions because you are dealing with incomplete information more often. Another benefit of being in position is that you have a better chance of controlling the size of the pot, which is often based on the strength of your hand and your overall goal in the pot. Being out of position to one or more opponents gives them the ability to control the pot size and also capitalize on the added information of knowing your actions first. Because Omaha is so focused on the nuts, it might seem like bluffing plays an important role in the game. A player can represent a wider range of hands in Omaha, and also open up with a bit more with so many more semi-bluffs available. In fact, experienced Omaha players will often bet big draws heavily on the flop, since in some cases those draws are actually mathematical favorites versus made hands. All of which is to say players do bluff in pot-limit Omaha, but with so many possible hands out there you have to be judicious when deciding when it is best to bluff. The more you learn about the game, the easier it will become to pick up on these spots and determine how to proceed against various opponents. Relatedly, blockers also become much more prevalent in Omaha than in Texas hold'em. Blockers are those cards you hold in your hand that prevent an opponent from making a specific hand. For example, if a board reads and you hold the in your hand but no other spades, you may not have a flush, but you know your opponent cannot make the nut flush. This gives you added power in the hand being able to push your opponent off certain hands as your opponent is guaranteed to not contain the nuts. Omaha poker is a game of action, but it can also be a game of big swings. Many players first learn Texas hold'em before taking up learning the rules of Omaha. Having a good knowledge of fundamentals in Texas hold'em helps a lot when making the transition into Omaha.